In case you can’t count, there are no less than three, count them THREE antibacterial soaps (which according to the Editor of Consumer Reports does NOTHING to help control any flu), Lysol Wipes and Oust Spray cleaner for good measure. 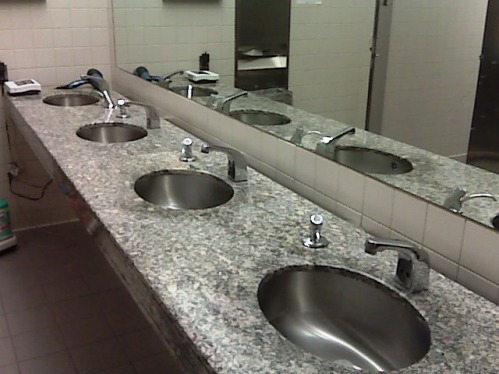 Add to that, the soap already in the soap dispensers that we used to use in the days before the deadly epidemic. (As of today 109 cases reported in the US–that’s out of 304 million people. And, even though I did snooze all through my math class, that seems, like, um, well not that many people compared to the 36,000 people that get the good old fashioned flu every year. ) Or lthe 5000 deaths from food poisoning every year. But then, what do I know? 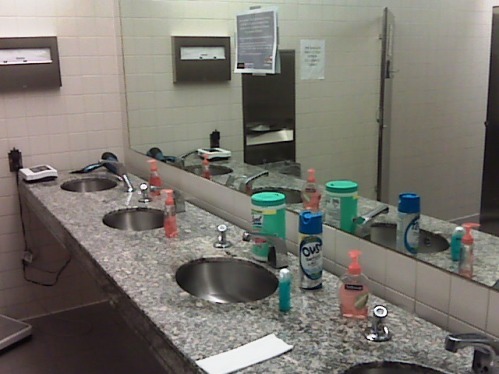 Clearly, not enough to wash my hands every time I go to the bathroom, so the New York City Department of Health wanted to make SURE, (just in case I didn’t already) I knew that washing hands helps prevent the spread of germs. 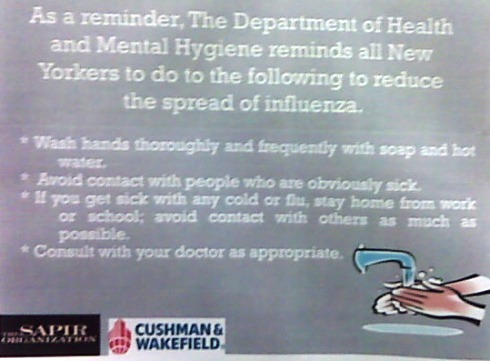 I especially like the fact that we are told to STAY HOME in case we get sick. Perhaps NOW all the coughing, sneezing and choking employees on the other side of my wall, will finally get the message. And if NOT? Hell, I’ll take a sick day for the good of the people. Won’t you? **I especially like how our real estate companies are participating in the campaign to STAMP OUT this global pandemic. Don’t you?